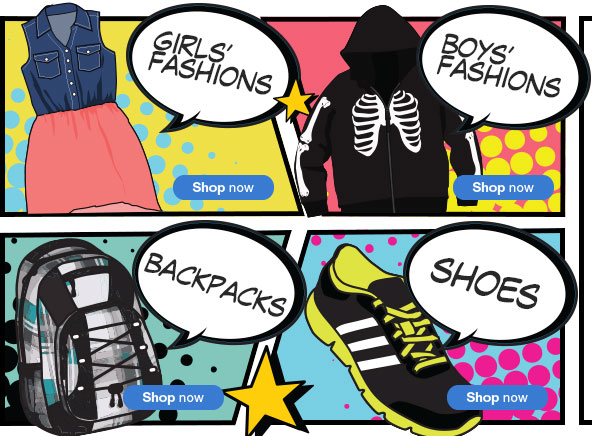 The new trends, new fashions, new colours, can be both exciting and overwhelming when shopping back to school. For all children, especially my daughter how she dresses plays an important role in expressing her personality, style, and individuality. I like that Sears carries a variety of top quality brands at reasonable prices. They have a wide selection of styles that children will enjoy wearing. This year, throughout the month of August, Sears Canada (The Kids Room) has been, helping families with school-aged children get ready for back-to-school so they can Rock the Halls. They have been surprising families in-store and online all over the country, by providing their purchases to them for free. Check out this video to see what is happening in the stores. Sears Canada will also be rewarding their Facebook fans by surprising them throughout the month of August with opportunities to win a $100 Sears gift card. I think giving back is important, regardless of the time of year. It is amazing how schools get students involved in giving back through programs such as Jump Rope for Heart, Terry Fox Run, and Food Drives. I think as parents we should always encourage our children to give back to their community, either locally or across borders. Even before school starts when I go through their closets I put away the clothing that are in good quality and have become small by giving it to friends, family or community clothing banks. This way I know the money I spent on quality clothing is not going to be wasted. Sears Canada has been a proud supporter for over 40 years of Boys and Girls Club across Canada. Boys and Girls Club is Canada’s leading provider of quality after school programs that support the healthy physical, educational, social and mental development of Canadian children and youth. Sears shares Boys and Girls Clubs of Canada’s philosophy that providing all Canadian children and youth with access to opportunity is essential to helping them achieve their full potential and create a better future. To help out with this year’s back-to-school season, Sears Canada and Converse will be providing the Boys and Girls Club with $10,000 worth of back to school apparel. Win a $100 Sears gift card before August 27th. This giveaway is open to everyone in Canada (excluding QC). You may enter to win across multiple blogs, but can only win on one. You can expect to receive their prize 4-6 weeks after the contest closes. I live Newfoundland. I give back by donating to the food bank, cash donations to charities, toys to the local happy tree and clothes and household items to the Diabetes Clothline. I live in Calgary. We donate when we can to the food bank, and our used (but in good condition) clothing to the salvation army and children's village. We donate for the toy drives at Christmas time, and whenever the kids schools are collecting items for donation, we try to contribute as well. I live in Ontario and I volunteer at school all the time! I live in southwestern Ontario. I donate to the food bank as well as help out at the school. we also give back to our local nursing homes, taking a variety of animals in to visit! I live in BC and we give back by donating various winnings I receive to local charities! We live in Abbotsford, BC. We give back by donating to charities in our area. I give back by donating clothing and good used items to thrift stores. Ontario, helping out with my local animal rescue. I live in NB. I give back by volunteering at our local homeless shelter as well as supporting a number of charities financially. I am in Ontario. We donate food and money, as well as clothing and other items. Manitoba. I donate clothing and household goods to the Cdn Diabetes Assn and support my local animal rescue. Toronto. I give back with cash donations to different organizations and donating clothes and toys. I live in Ottawa, Ontario. I give back during the year by donating food and clothing as well as helping out when I can. I live in NW Ontario. I give back with money donations, canned food for food drives, donate clothes and books. I live in Ontario. I give back by donating to the food bank and clothing/toys to charities. I'm in Ontario. I donate clothes/household items to various pick ups, donate cash to charities, donate to local food banks and donate toys at Christmas. I live in NL, We give back by donating to the goodwill and the food drives. Ontario and I volunteered at the food bank before. I live in Newfoundland and we always buy enough school supplies for two kids and send them to school every year! :) Thanks! I live in Newfoundland. I donate clothing, money, and food throughout the year. We live in Ontario. This year we gave back by growing a couple extra rows of veggies to bring to the local food bank...beans and spinach. I live in Ontario. I give back by donating clothes, toys, school supplies and food. I live in Ontario and I give back by donating clothes to various charities. I live in Ontario and I donate my used items as well as donate at Walmart and other stores when they ask. I live in calgary. I donate to Goodwill, buy at goodwill to recycle instead of buying new all the time. I live in calgary! Forgot to add that! I live in BC. We donate gently used clothes and to the food bank through the year. I live in Saskatchewan and I give back by donating clothes and kids toys. i live in ontario and we donate to christmas cheer each year. I live in Saskatchewan. I often donate prizes I win, or money I win. I also donate food. Live in ON, donate our clothes regularly. Calgary. I help fundraise for children with autism. We live in Edmonton,Alberta. Instill the values of giving and being a humanitarian with my 10 year old son Evan. It is paramount that we appreciate what we have in Canada and when we can donate to food banks/Terry Fox organization/Fill Edmonton School Bus campaigns...*you get what you give*....compassion the reward. I live in Ontairo ... we donate off and on to Sick Kids throughout the year, we also donate many brand new toys/clothes/household items/women's things/mens' things.. at christmas time in memory of my grandson who passed at 10 months old from SIDS. I live in Ontario and I donate as much food and clothing and toys as I can during the year. We donate clothes twice a year. I donate clothing and to the food banks. I live in Nova Scotia.I give back by volunteering at my church and by donating used items to various charities. Ontario. I donate clothes and anything I'm not using, but might be useful to someone else. I live in Ontario. We donate our time, talent and treasure. I live in Winnipeg & give back by volunteering at my daughter's schools, donating to Koats for Kids & to the local toy drive at Christmas. Thanks for the chance to win! I give back by fostering and helping with rescue groups. Ontario and I donate my things to good causes. Live in Ontario, and give back by giving when I can. I'm in NB, and we try and make food for older people. I live in BC. We donate money or supplies to various local charities like our food bank and spca and international groups like AMREF. BC. We do many runs and raise money. I live in Ontario and give back by volunteering my time in our community. I live in Ontario and I give back by volunteering my time in our community. I'm in BC. We make a cash donation to the food bank 4 times a year.